Almost everyone with knee arthritis is wearing some sort of a contraption or the other for relieving their pain. These externally worn aids are called by various names, knee caps, braces etc. Do they really help? Let's find out. Theoretically a brace should offload the diseased portion of the knee, in order for pain relief. It is therefore obvious that all soft knee braces like the knee cap are ineffective in doing so. Let's face it, something slightly thicker than socks cannot protect your knees. However they do bring about pain relief from a different mechanism. They tightly encircle the knee & the user's brain gets the feedback that my knee is tight or something is supporting my knee. 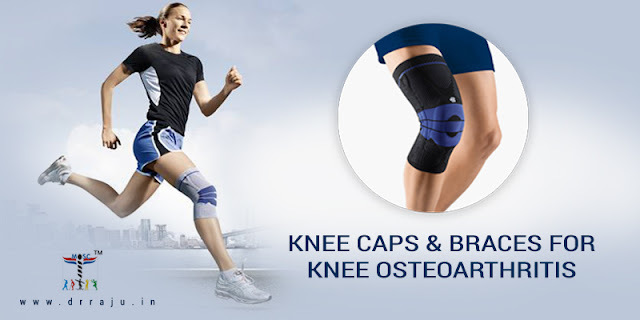 What actually happens is that their wearing either takes away or distracts the brain from the knee pain or induces a reflex contraction of the thigh muscle (the quadriceps) that gives a feeling of having a stable knee. Pain after all is an unpleasant sensation conveyed by the nerves to the brain & diverting the brain's attention is the main way by which all the anti-inflammatory creams work. Most of them contain an irritant that sets up a minor pain sensation around the overlying skin, that diverts the brain's attention away from the bigger pain smouldering inside! It is a widely held myth that they actually penetrate through the intact skin & heal the hurt. The rigid knee brace or the hinged knee brace is used in case there is injury to the collateral ligaments of the knee joint. The knee has 2 sets of ligaments called the collateral ligaments that run along the inner & outer side of the knee respectively. They usually get injured in a fall & depending on the direction of the fall either the inner (medial collateral ligament) or the outer (lateral collateral ligament) gets injured. These hinged braces are useful in helping these injured ligaments heal. They have absolutely no role in knee osteoarthritis, unless there is diagnosed ligament instability by a clinical examination. The offloading braces are a whole new species of knee braces. These braces are designed so that once worn, they offload a certain portion of the knee & transfer that load to the other portion, something like Robin-hood (steal from rich & give to poor). They are very useful in moderate to mild stages of arthritis (decided by the x ray) in which one expects one half of the knee (usually the inner half) to be diseased & the other half of the knee (usually the outer half) to be healthy. In advanced arthritis (again decided by the x ray), wherein both sides of the knee are diseased, they have no role! Yes & no. You certainly don't need a knee cap or a hinged brace for arthritis. You are much better off & much more comfortable doing exercises & making subtle changes in your lifestyle (refer to my earlier blog post). If you have end stage knee arthritis, then also you won't benefit from any brace, you may be better off getting a knee replacement. If your doctor is able to diagnose isolated arthritis of one half of the knee, then you will benefit from an offloading brace. The problem with the offloading brace is that it also offloads your purse! Most such braces come upwards of 30000₹ per brace. Another problem is that you need to wear them throughout the day, which may be a challenge in our mostly tropical climate & if you are fond of tight clothing. Sometimes these braces simply don't fit us Indians as they are designed for Caucasians, we sometimes have a great discrepancy in the thigh & leg diameters & that causes the brace to lift off the skin in some places. An ill fitting brace will not work for you & might actually be counterproductive by constantly rubbing against the skin & eventually ulcerating it! How soon will the brace start having its effect? We are all in a terrible hurry to see results, especially after spending a fortune on the offloading brace. Results in term of pain relief takes time. Initially just like a new shoe, the knee may feel sore. Some people don't obtain that much relief in pain, but their mobility & joint flexibility improves. In a nutshell it is unrealistic to expect magic from the brace. Be prepared to wait out a few weeks for its effects to kick in. Yes, but only on a doctor's prescription. All the braces available off the shelf are mostly ineffective as far as knee osteoarthritis is concerned. Kick off your knee caps & exercise instead. Adopt simple lifestyle changing measures (ref, my earlier post) to get relief from the pain. Consult your orthopaedic surgeon to see if offloading braces will be useful to you.